Not long ago, Attitash in Bartlett celebrated its 45th anniversary. While many of its early themes–the Red Carpet ski area, limited ticket sales, and the world’s first cog monorail ski lift–are largely forgotten, today the resort thrives as one of the mainstays of Mount Washington Valley skiing. Bartlett has a ski history that started much earlier than Attitash, though the town’s contributions to skiing tend to be overshadowed by better-known incidents and personalities in Conway and Jackson. While certainly not complete, these stories may serve to recall that skiing in Bartlett has had its moments. In Bartlett as in many other New England villages in the 1930s, the first significant ski trails were cut by the Civilian Conservation Corps. The CCC cut two trails in Bartlett in the summer of 1933–the Maple Villa trail on Bartlett Mountain in Intervale, and the Bear Mountain Trail south of Bartlett village. The Maple Villa started very near the New England Inn, and was a popular trail with ski train passengers due to its proximity to the Intervale and North Conway railroad stations. It dropped 1900 vertical feet over 2 1/4 miles, and was rated for beginners and intermediates. Bartlett seems to abound in high points named for bears, and the mountain of the CCC trail was not the Bear Peak that is a relatively recent addition to Attitash. The CCC’s Bear Mountain Trail was divided into an upper and lower section by the crossing of the then-new Bear Notch Road. The upper section was for experts, with a vertical drop of 1700 feet in less than 1 1/2 miles. It became a quiet favorite among the White Mountain ski trails, and became the particular domain of the Schussverein Ski Club, which ran an invitational race there from 1937 until the war years. Shortly after the 1939 arrival of Austrian skimeister Hannes Schneider in North Conway, he and his instructor Franz Koessler surveyed the Bear Mountain Trail and recommended that it be rated a Class A race trail. This designation was granted by the Eastern Amateur Ski Association, and meant that the Bear Mountain joined four other New England trails–the Wildcat, Nose Dive, Taft and Thunderbolt–as venues for racing’s most severe tests. The legendary 1939 American Inferno on Mt. Washington had its genesis at the 3rd Schussverein invitational downhill on the Bear Mountain Trail. “Last week as we stood on Bear Mountain and viewed the complete snow covered beauty of Mt. Washington, there was a hue and cry from the old guard that we must revive the old Hochgebirge Inferno Race, which means the old down Mt. Washington Race from Summit to Pinkham Notch,” wrote Alec Bright to the White Mountain National Forest Supervisor. In a matter of weeks Bright and his Ski Club Hochgebirge had organized the race that is remembered today for Toni Matt’s hair raising schuss of the Tuckerman Ravine headwall. Also serving skiers in Upper Bartlett in the 1930s was the Stanton Farm, a rope tow slope in the area of today’s Stillings Grant. Stanton has a place in ski history by virtue of its association with a young man who lived in an adjacent farmhouse in the late 1930s and skied at the ski slope in his back yard. Pete Seibert’s father arrived in town to serve as a civil engineer with the CCC as they performed forestry projects in the Bear Mountain area, and the family rented the Stanton farm. 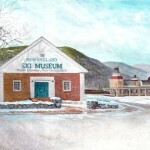 “We probably lived in one of the first ski-in/ski-out homes in the US,” Seibert wrote in his biography. A few years later, Seibert joined the 10th Mountain Division, and was grievously wounded in Italy. After the war he settled in Colorado, intent on finding a mountain on which to start a resort that would combine fine skiing with a European style village. Anyone who has visited Vail knows how well one-time Bartlett boy Pete Seibert succeeded in realizing his vision. 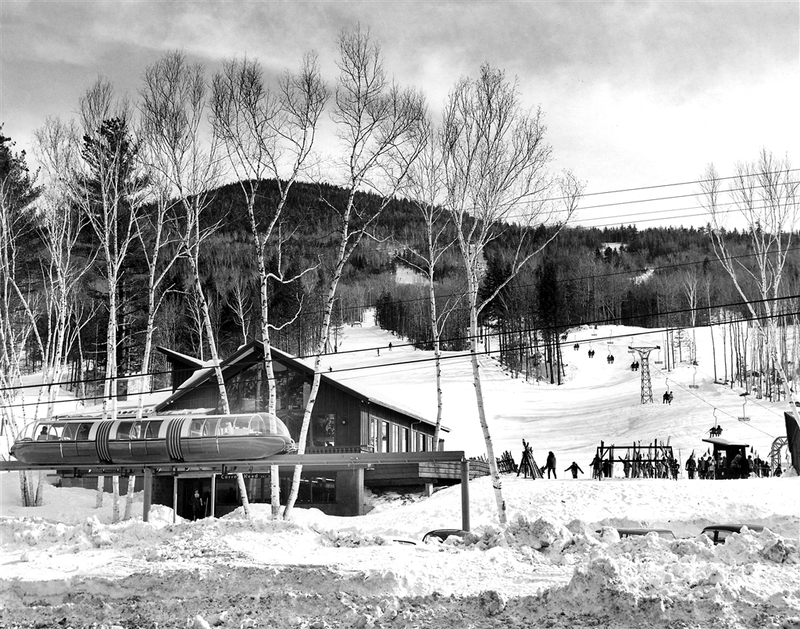 Long before American Skiing Company acquired Attitash in the early 1990s, Bartlett was home to a ski area that was part of a multi-resort empire called Ski Tows Inc. assembled by brewing heir Fred A. Pabst, Jr. Finding skiing more congenial than taking a position in the family business, Pabst embarked on building ski areas around the northeastern US and nearby Canada in the mid-1930s. One of his early locations was Intervale Ski Area in Bartlett, just behind the New England Inn and near the base of the Maple Villa Trail. As he did at many of his other areas, Pabst installed an early J-Bar lift, which was the state of the art in ski lifts at the time. In 1939-40 the Eastern Slope Ski Club obtained help for Intervale by the Works Progress Administration, which did slope and trail work and built a footbridge over the East Branch to allow for parking on Town Hall Road. That was the peak year of Pabst’s “chain store” of ski resorts, and Intervale contributed 10% of his total receipts of $33,664. In the next few years, it became evident that the war and the far-flung nature of Pabst’s empire were both hurting his business, and he began to retrench, ultimately moving many of his J-Bars to Bromley, Vermont, where he could concentrate on a larger, consolidated operation. The Stimpson family operated Intervale after the war. The area featured a Poma lift installed in 1956, a ski jump used by school teams, and a Tucker Sno-Kitten for grooming. “There is just about the right amount of ski terrain for the capacity of the lift,” wrote Sel Hannah after looking over the area for a potential buyer in 1961. “The surrounding terrain lends itself to expansion. The area can double.” Hannah estimated it would cost about $175,000 to put in a double chair and expand the area to match it. The New Jersey resident did not pursue the area, and by the early 1970s Intervale was leased to Eastern Mountain Sports, the outdoor retailer, which operated it as a nordic center for several years. In 1950, Bavarian-born Peter Limmer, maker of some of the first ski boots in the US, moved to Intervale and established his bootmaking business in the old Harmony Dancehall. Limmer had emigrated from Germany to Jamaica Plain, MA in 1925, and had been ski boot maker for the elite in Boston from the mid-1930s on. Ski boots continued as a mainstay of the Limmer and Sons business in Intervale until the advent of the plastic boot in the 1960s. 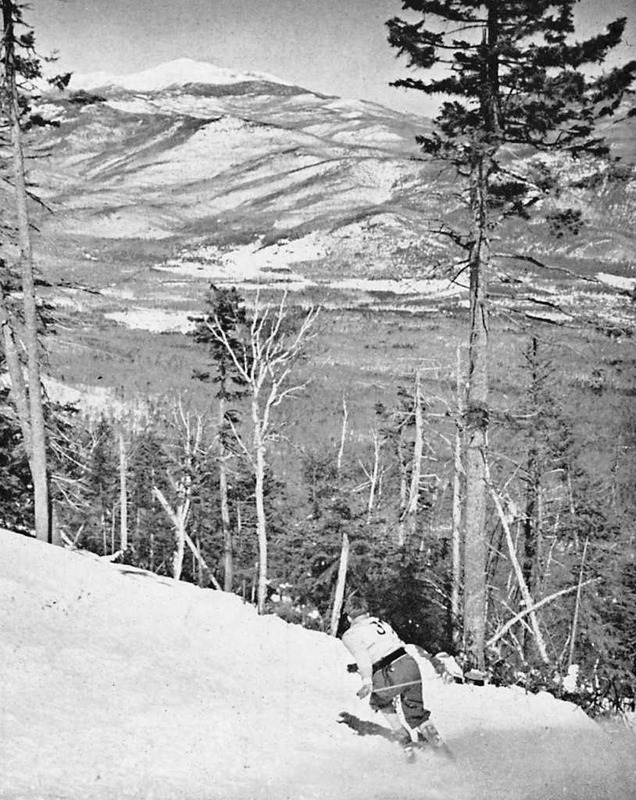 The US Forest Service evaluated many locations in the White Mountains for ski resorts in the 1960s. Among them was a site just north of Bartlett that Sel Hannah saw as having “the physical potential for one of the major ski areas east of the Mississippi.” This was the eastern exposure of Saunders Mountain, in Hart’s Location between the Sawyer River Road and the Notchland Inn. ‘Sawyer River Skiways’ was the planned name, and it would have had a vertical drop of more than two thousand two hundred feet. Beginner terrain would have extended onto the lower slopes of Mt. Tremont, and a ski touring trail was planned from the summit of Mt Saunders to the abandoned townsite of Livermore. It is unclear why this 1964 plan did not take shape, but by that time planning was underway for Attitash. Among the original people involved with Attitash were Phil Robertson, recently retired as manager of Mt. Cranmore, and Thad Thorne, a veteran of the 10th Mountain and Wildcat. Robertson had extensive ski area experience. He had been involved with the original overhead cable lift in the valley (one of the first two in the country), installed at the Moody Farm in Jackson in 1935. (The designer of the lift, George Morton, was a Bartlett mechanic and engineer who later invented the Skimobile). 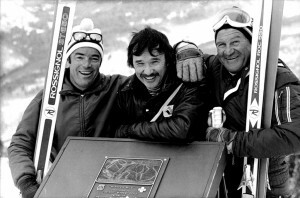 As manager at Cranmore Robertson had a hand in the development of the earliest ski area grooming system known in the US. 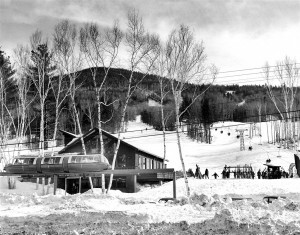 Attitash opened in January 1965, calling itself “the red carpet ski area” for its customer service focused on limiting lift lines by limiting ticket sales. In an era of 30 or 45-minute lift lines this was an appealing philosophy, but was quietly dropped by the end of the decade. Phil Robertson, perhaps recalling the success Cranmore had in developing an entirely new form of ski lift with its Skimobile, became an advocate for a cog monorail ski lift at Attitash. In early 1967, a full-size model was installed at the base, and the line of the track was eventually cut to the summit. “Reality set in” when construction planning started, recalled Thad Thorne, and the uncertain prospects of obtaining financing and Forest Service permission for the expensive, unproven experiment caused its quiet abandonment. Growth at Attitash continued with the summer Alpine Slide in the mid-1970s, the installation of snowmaking after several snowless winters in the early 1980s, and the expansion to Bear Peak in the 1990s. While the cog monorail and limited ticket sales are distant memories, one 1966 Attitash event still resonates. 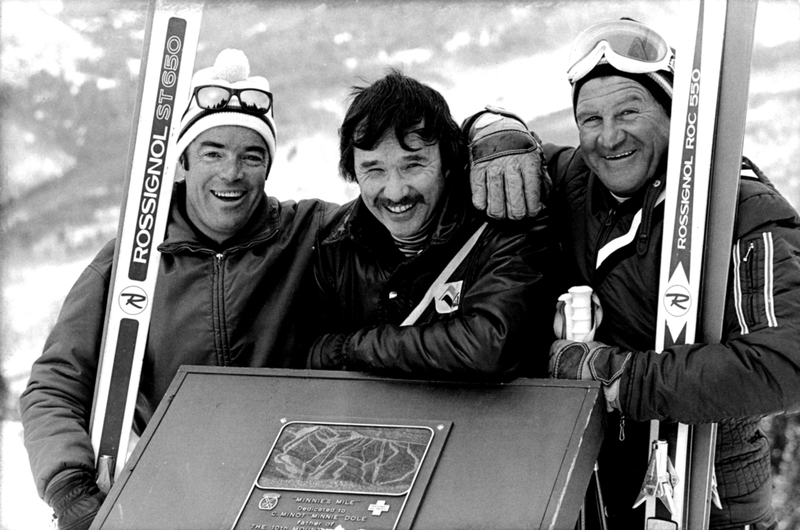 In January of that year the Ski Masters event became the first meet in the US to include a freestyle skiing element. Conceived by Peter Pinkham, then president of the Eastern Slope Inn, the event bore little resemblance to today’s mogul and aerial competitions, but nonetheless marked the dim beginnings of what would become an Olympic sport. Few towns can claim as much.